Learn how to work with airlines, hotels and tourism boards. 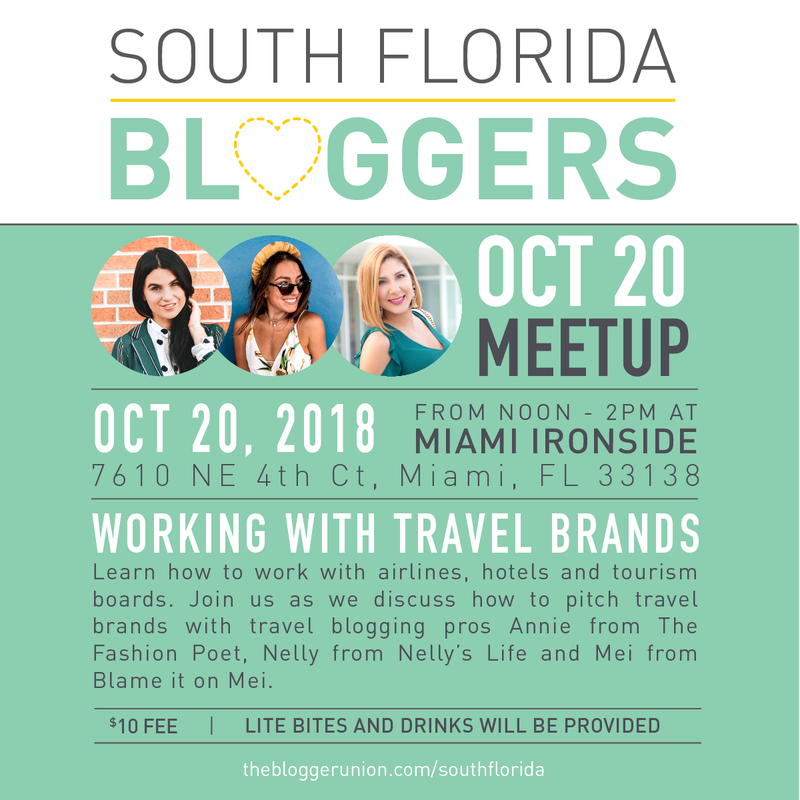 Join us as we discuss how to pitch travel brands with travel blogging pros Annie from The Fashion Poet, Nelly from Nelly’s Life and Mei from Blame it on Mei. This young entrepreneur was voted Miami’s Top Fashion Blog by The New Times and recently was awarded Best Fashion Content Creator Award at the Hispanicize x Telemundo Awards. Her work has been featured in glossies such as Vogue, Marie Claire, Elle, The New York Times, Life, Refinery 29and more. She was the first blogger in Miami to score a major campaign with fashion brand Coach where she produced and starred in a 1 minute commercial for them. Savvy and creative, Vazquez has gone on to work for several other brands as a spokesperson, model and consultant. Some of these top tier brands include Mercedes Benz USA, Bailey’s, Peroni, Tresmme, Victoria Secret Pink, 7 for All ManKind, Forever 21, H&M, Express, Macy’s, Express, Bloomingdales, TMobile and Sprint. Nelly is a passionate traveler who loves to immerse herself into new cultures and experiences all around the globe. She has an adventurous spirit and loves to try new things, even if it means overcoming her fears by flying with a paraglide, doing a walking safari or diving with sharks. She is also eager to learn about different cultures, which she says enriches her life in so many aspects. She is your girl when it comes to foodie spots, she has her favorite spots around the world and loves to share it with her community. She is seen as grounded and down to earth which is something her followers love about her. Nelly’s positivity and joy shines through her pictures from the most magical spots the planet has to offer. Nelly has a background in advertising and is an female entrepreneur since 2010. Her professionalism, and the understanding of what brands need is maybe one of the reasons why brands like Audi, the European Travel Agency TUI Fly, luxury hotels and lifestyle brands love working with her. She knows what her strengths are and what YOURS might be so join us on this panel. 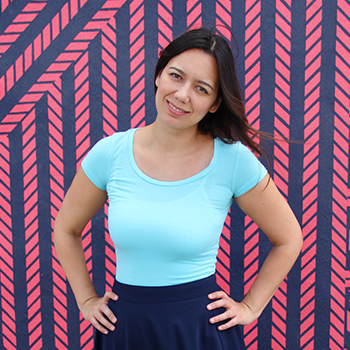 Mei Jorge is the founder and creative mind behind the award-wining and bilingual style, beauty and travel blog Blame it on Mei. This Cuban-born gal’s passion with fashion dates back to her childhood’s tropical surroundings. She describes her style as feminine, classic and chic; with subtle but undeniable pops of colors. Her clean and fresh aesthetics has called the attention of several national and international brands. Mei has worked with retailers like Macy’s, Kohl’s, Coach, Saks OFF 5th, Banana Republic, and Ralph Lauren among others. And in the beauty genre, she has been part of campaigns for Dove, Neutrogena, Gillette Venus, Aveeno and Colleen Rothschild Beauty to name a few. Mei has also worked with a few enigmatic South Florida hotel brands like Hilton and The Biltmore, and while abroad, with Secrets Resorts. Mei enjoys sharing her knowledge of the blogosphere and has been invited to be a speaker at We All Grow Summit 2018 in Long Beach, California, Hispanicize Week 2018 in Downtown, Miami and during events for local chapters of The Blogger Union also in Miami. As another accomplishment, she was recently awarded with ‘Best Lifestyle Blogger of 2017’ by South Florida Bloggers. Mei and her husband currently welcomed a beautiful baby boy named Julian. Thanks to Miami Ironside for hosting and providing lite bites and drinks for our meetup. Is the meeting just for bloggers ?? ?